YOU’s 23 October issue caused great debate in the past few days. Editor Linda Pietersen responds to those who were hurt and offended by it. YOU’s 23 October issue caused great debate in the past few days. Here editor Linda Pietersen responds to those who were hurt and offended by it. We are very sorry we offended some cancer survivors and their family members with our cancer awareness campaign. The magazine often covers heartbreaking news stories related to cancer but for breast cancer awareness month we wanted to do something different, something that would really make everyone sit up and take note. And this is exactly what has happened. Unfortunately, a lot of it has been negative and it was certainly not our intention to hurt anyone or mock people with cancer, as some of our critics put it. Our intention was always to raise awareness for the Cancer Association of South Africa – and this campaign certainly has succeeded in doing just that even if some of it was accompanied by criticism towards us. Before going ahead we consulted CANSA, which fully endorsed our campaign. They have been as taken aback as we have by some of the negative reaction to the YOU story, pointing out that they’ve partnered in this type of campaign before with another big magazine, which received a positive response from the public. Although generally social media commenters veer toward the negative there have been positive responses too. Many readers have called in and emailed us applauding our campaign. Many thanked us for putting this terrible disease in the spotlight. Many told us how it had moved them and reminded them of the loved ones they've lost or are fighting cancer right now. So many critics have said we should’ve used real cancer survivors for the story but the reality is celebrities have much greater pull. For example, we had a woman on our cover recently who died of cancer. Her doctor husband wrote a piece so heartrending it moved many of us to tears – yet it barely raised any awareness and certainly didn't have people flocking to support CANSA. That’s why we decided to ask celebrities to do this with us. And because their image is their livelihood and their hair is an integral part of their public image we opted to digitally remove their hair. Some people said our article was misleading because they thought the celebs had really shaved their hair but at no stage did we pretend that was the case. It was stated clearly in the editor's letter and in the copy that it was digitally removed. Critics also pointed out that these celebs are shallow and asked what they know of suffering and cancer. Well, almost all of the celebs who took part have been touched by cancer in some way. Cover star Lee-Ann Liebenberg, for example, dedicated her shoot to her father, Allen, who battled lymph and lung cancer, Zaakeya’s grandmother battled breast cancer and Shashi lost an aunt and uncle to the disease. Like it, or hate, this campaign has got people talking about cancer and that was always our objective. The magazine will continue to bring its readers stories about cancer, be they tragic, triumphant or informative. Together we can fight this terrible disease. 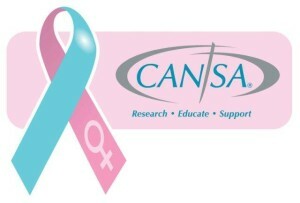 Show your support by donating to CANSA; like their Facebook page, visit their website – www.cansa.org.za – or call 0800 22 66 22. Visit the CANSA website, www.cansa.org.za, to see how you can help fight the disease.